In a narrow street off the Boulevard St-Michel in the Latin quarter of Paris, between odorous stalls serving kebabs and crêpes, is the tiny, 92-seat Théâtre de la Huchette, where Eugène Ionesco’s absurdist play La Cantatrice Chauve (The Bald Prima Donna) has been playing non-stop for 51 years. The director of the unchanged production, which has entered the Guinness Book of Records as the longest-running play at the same venue, was Nicolas Bataille, who has died aged 82. Bataille, who also created the role of Mr Martin, which he played hundreds of times over the years (the last time in June 2007), could claim to have launched Ionesco’s career. In 1949, already gaining a reputation in avant-garde circles, he received a manuscript called L’Anglais sans Peine (English Without Effort), a first play by an unknown Romanian exile in France, inspired by the banality of the expressions used in an English-language phrase book. He immediately decided to stage it in a small theatre on the Left Bank called Les Noctambules. The film director Claude Autant-Lara, a friend of Bataille’s, gave the company the costumes from his just-completed film Occupe-toi d’Amélie, and an antique dealer lent them some Second Empire furniture. Bataille had first tried to play it as a parody but discovered, during rehearsals, that it was funnier as a serious drama. Legend has it that during a rehearsal, an actor, instead of saying une institutrice blonde (a blonde teacher), said une cantatrice chauve, thus prompting a change in the title. Among the audience at the premiere on May 11 1950 were Raymond Queneau, André Breton, Philippe Soupault and Arthur Adamov, but the play failed with the critics and the public. Undeterred, Ionesco went on to write La Leçon (The Lesson, 1951) and Les Chaises (The Chairs, 1952), and when Bataille restaged The Bald Prima Donna at the Théâtre de la Huchette on February 15 1957, he had become, with Samuel Beckett and Adamov, a leading figure in the Theatre of the Absurd, a term coined by Martin Esslin in 1961. This time, financial help came from the 25-year-old Louis Malle, who had just made his first solo-directed feature, Ascenseur pour l’Échafaud (Lift to the Scaffold), in which Bataille apppears as a restaurant customer. He was born Roger de Bataille in Paris, the son of an architect. He studied acting at the celebrated Cours Simon drama school before making his first appearance on screen, aged 17, as an extra in Marcel Carné’s Les Enfants du Paradis (1944). At the liberation, he and the writer and director Akakia Viala (Marie-Antoinette Allévy) staged a theatrical version of Arthur Rimbaud’s poem Une Saison en Enfer, as well as creating a scandal by pretending to have discovered a lost poem by Rimbaud entitled La Chasse Spirituelle. Written by Bataille and Viala, it was published in the magazine Combat in May 1949, with only Breton sniffing out the hoax. But when published in book form, it became a bestseller. A few years later, the pair put on a version of Dostoevsky’s The Possessed, in which Ionesco played the role of Stepan Trofimovich. After The Bald Prima Donna had settled into the Théâtre de la Huchette – accompanied by The Lesson in 1959 – Bataille had brief roles in several films, notably Jacques Tati’s Mon Oncle (1958), and Malle’s Zazie dans le Métro (1960) and La Vie Privée (1961), where he was seen as a director rehearsing a Kleist play. 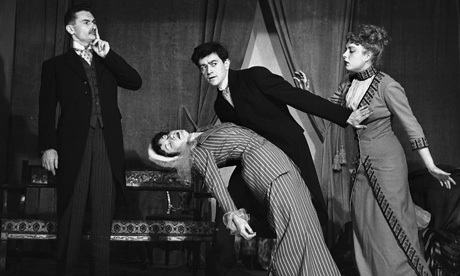 There were also a number of theatre productions, usually adaptations from other sources – such as a staging of the Marquis de Sade’s La Philosophie dans le boudoir, which was promptly banned by the Prefecture of Police – and works by Jean Cocteau, Jacques Prévert, Boris Vian, and other works by Ionesco, which he added to the repertory of the Théâtre de la Huchette.